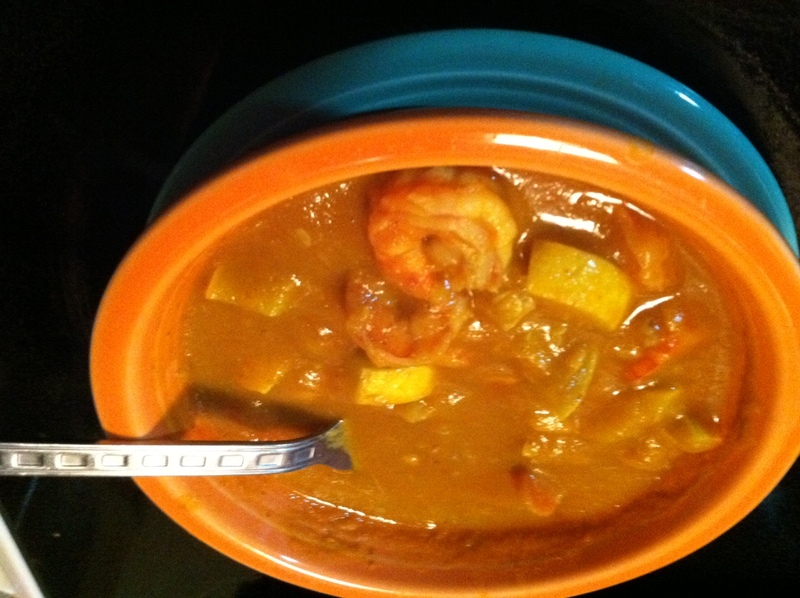 Here is a picture of the pumpkin curry I mentioned in the previous post. Had I thought about it, I would have put it in a different bowl, because the soup is obviously the same color as the vessel it was eaten from. Also, I will probably never get the gist of photographing food, which kind of makes me sad, since food is my most favorite thing in life next to swimming (which I can’t photograph well either!). 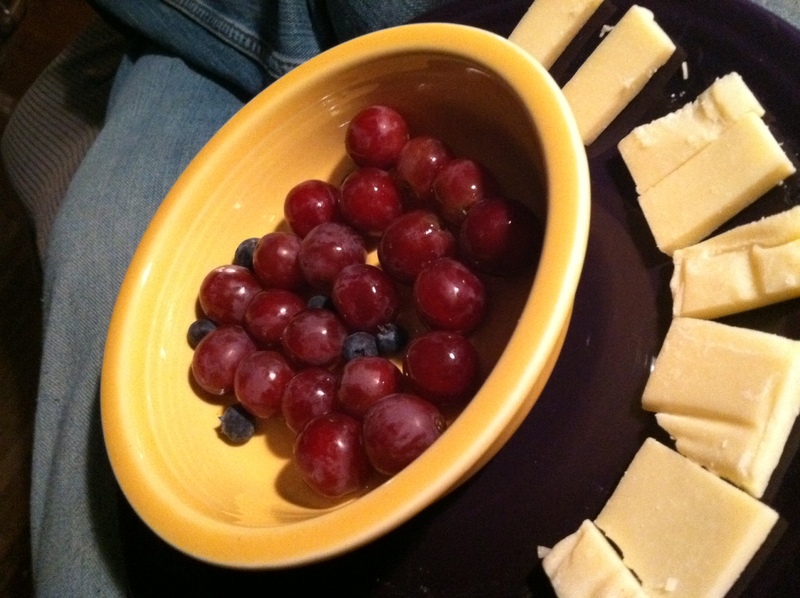 Here is a photo of tonight’s delicious dinner: grapes, blueberries, and raw milk extra sharp cheddar from grass-fed cows. Delicious, light, and everything dinner should be! "Do you have any staples? No? Well, then, do you have any gwapes?" 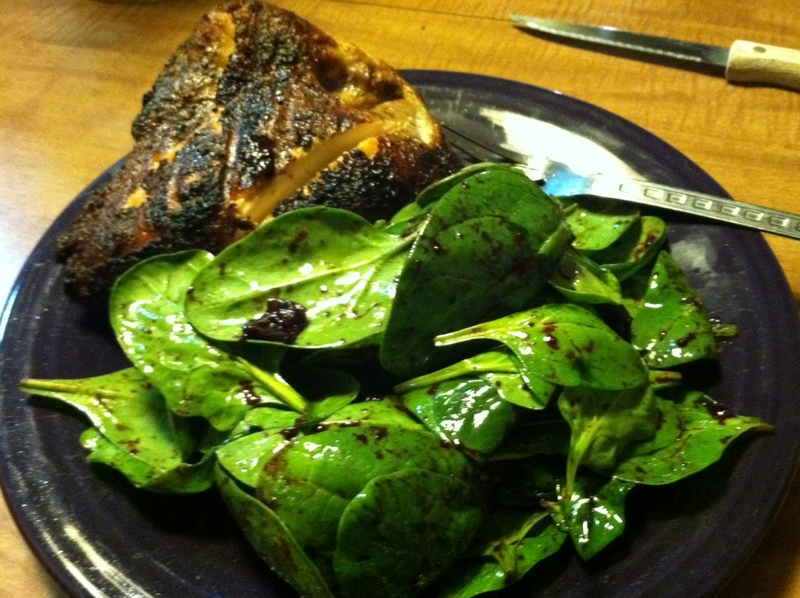 And because I’m sort of messed up like this, here is a picture of dinner a few nights ago: grilled/blackened bone-in chicken breast and spinach salad with bacon, blueberry, balsamic dressing. Early this morning my brother, my parents, and I went to Trader’s Point Creamery for their farmer’s market. We also stopped at Whole Foods and The Fresh Market, but, in between, we went to Brunchies in Carmel to have—you guessed it—brunch! 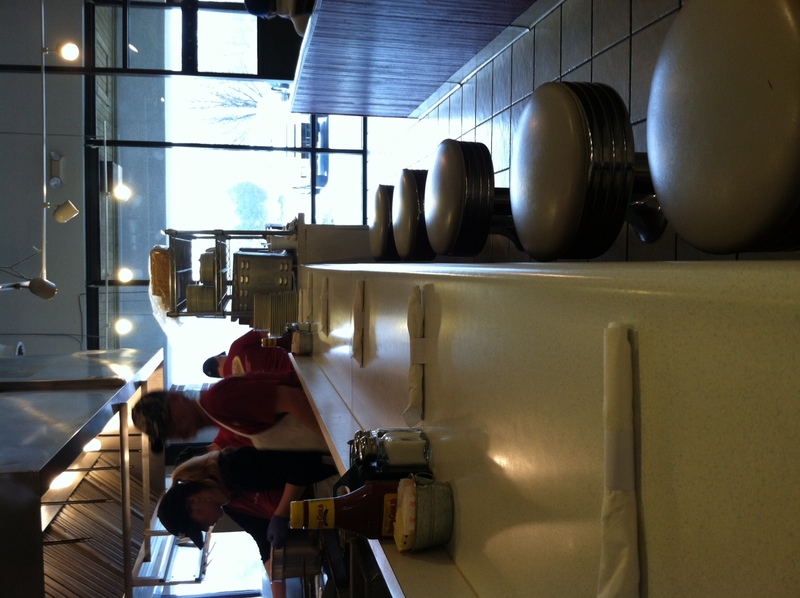 I had a three-egg omelet with spinach, mushrooms, jalapeños, and sausage and hash browns. It was delicious, and their coffee was pretty tasty, too. Finally, right now I am enjoying a delicious Samuel Smith’s Organic Cider. I’ve always been pretty much a Porter girl, but since I’m trying to stick to a primal lifestyle, when I do splurge with alcohol, it’s mostly with hard ciders. (I mean cave people probably let their apples or fruit ferment from time to time, right?!) I didn’t used to enjoy them at all, but now I find great pleasure in sampling different ones. Also, I’ve noticed—whether the wheat, hops, barley, malt, whatever—I have an allergic reaction almost every time I drink beer. My cheeks flush and get hot, and the whole affair is simply rather unpleasant. So far, so good with ciders of any kind. It’s been a great day, all in all. Conference. New Shoes. Fish Stir Fry. I was pleasantly surprised by the conference I went to today. Last year this same conference was pretty useless, and I left more frustrated than educated. This year, however, I went to two sessions by a woman named Jamie MacDougall. Her sessions were fun, upbeat, and informative. I got several great ideas about how to use primary documents to provide students with historically amazing mentors. For example, if a student is excited about feminist history, s/he could look at the primary documents of the Women’s Suffrage Movement in order to better understand some of the people who were involved in it. Through those documents, that student could then begin to form an understanding of the mentor’s philosophies, work ethic, thoughts, friendships, theories, collaborations, and other facets of their lives. Through this research students will become protégés of the famous person, choosing to pattern their lives after their role model/mentor, whether the mentor is alive or long passed. I also attended a session about quality curriculum, which inspired me to completely revise the way I approach the standards in my classroom next year. I think between the two sessions, I have a lot of work to do over the summer to make my classroom more student driven, but also more clearly focused on quality topics. Of course, this may mean being much more creative with gathering texts and with how I use the libraries (Ball State, Burris, and Muncie Public). Typically I run with no shoes or very minimal shoes, but as I mentioned in another post, I have a trail run coming up this Saturday. Today it is 40ish degrees and rainy, but by Saturday it could be zero and snowy or icy. I decided that running 6.55 miles in the snow might call for more foot protection than my VFFs could muster, so I purchased the flattest trail shoes I could find. I wanted some with decent tread in case of snow, a large toe box for my wide used-to-being-barefoot feet, and a pretty sweet design. I think I got all three things, but they are certainly not minimalist. I feel like I am on stilts when I run or walk in them, and I hope I can get used to that by Saturday night. 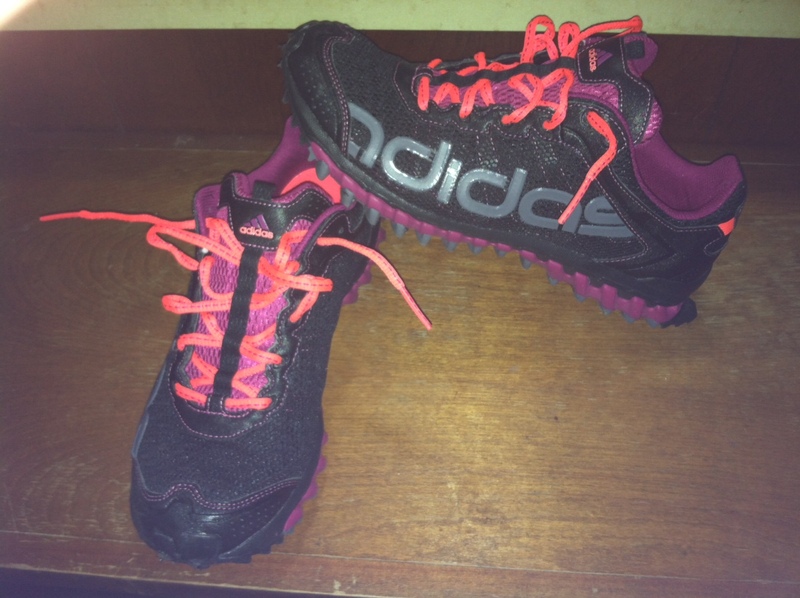 If the weather allows, I’ll still be running in my VFFs and keeping these Adidas Vigors as my standby shoes. This meal was entirely made up by me. If the recipe I am about to post resembles another one that exists, the similarities are entirely coincidental. Also, I am not real hip to measuring things, preferring instead to go by instinct. I am sorry if that bothers you, but it’s just how I cook. Recipe: In butter, saute several cod pieces/filets (use a couple more than you think necessary because they do cook down a little), which you’ve seasoned with seasoned salt and pepper, for about 3 to 4 minutes on each side. Remove them from the wok or skillet and just let them hang out for a bit. In the same pan, saute some green onions, grated fresh ginger, diced bell peppers with some salt and pepper. When those start to give off a good smell, add in some broccoli and carrots. Cook all the mess until your broccoli and carrots are almost the desired tenderness, which for Bec and me is al dente. Then spoon all the vegetables to one side to let them stay warm, while adding the fish back into the other side of the pan to warm it back up. If you want it all mixed together, you could do that now, but I prefer to serve out the vegetables first, topping them with the fish. I think the plate looks prettier this way, not like I just glommed out some stir fry and slapped it on the plate. I didn’t take a picture of this meal, but it was pretty tasty. The cod was a good choice of fish, but I think many other meatier types of fish would work, too.